The Experience Tour to reach 18 cities across India with the entire BMW India product portfolio on exhibit. BMW India has launched the second edition of the BMW Experience Tour in India. 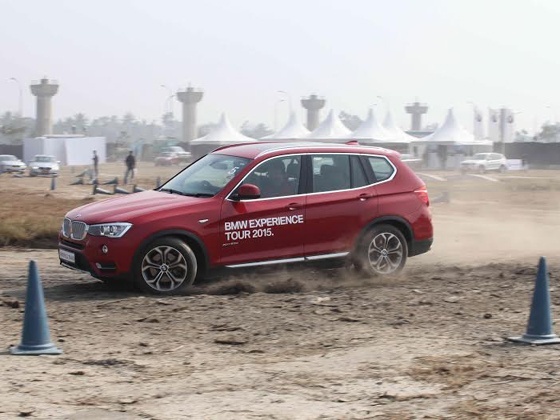 Beginning with Kolkata, BMW Experience Tour 2015 will demonstrate the dynamism, versatility and high performance of the entire BMW product portfolio in 18 cities across the nation. After Kolkata, the tour will reach Raipur, Nagpur, Surat, Ahmedabad, Gurgaon, Chandigarh, Jaipur, Mumbai, Pune, Indore, Vijayawada, Hyderabad, Chennai, Bangalore, Kochi, Delhi and Lucknow. BMW Experience Tour 2015 is designed to provide customers a platform to experience the BMW brand, test drive vehicles and interact with product experts. Customers will have an opportunity to experience the complete range of BMW sedans and SAVs (Sports Activity Vehicle) on a specially designed test course. Customers will have the opportunity to test-drive the BMW 1 Series, the BMW 3 Series, the BMW 3 Series Gran Turismo, the BMW 5 Series, the BMW 7 Series, the BMW X1 and the BMW Z4 through exercises like slalom, fast laps, corner braking and emergency braking. The BMW 7 Series Individual and the BMW 6 Series Gran Coupe will be on special display. The thrill of high-performing range of sports cars – the BMW M3 Sedan, the BMW M4 Coupe, the BMW M5 Sedan and the BMW M6 Gran Coupe; will also be felt at BMW Experience Tour 2015. BMW M Automobiles are produced by BMW Motorsport GmbH (a subsidiary of BMW AG). Sophisticated technology, individuality and safety – the BMW M cars offer an unmatched experience of exclusive, high-performance driving. The setup at the event will allow customers to experience the superiority of the BMW X range with the BMW X6, the BMW X5 and the BMW X3, under the expert guidance of BMW trainers. The BMW xDrive is an intelligent all-wheel drive system that monitors the driving situation constantly and distributes drive power smoothly between the axles where it is needed the most. In India, the intelligent BMW xDrive all-wheel drive system is standard in the BMW X3, the BMW X5 and BMW X6. Throughout the Experience Tour, a special structure will be created in each city, representing BMW’s premium international standards. The weather proof, air-conditioned structure, will accommodate the reception, briefing and display areas. Special recreation zone will ensure an entertaining time for the entire family. The section will also feature a special ‘Sony PlayStation Zone’ where children can enjoy driving BMW cars in the virtual world with Sony PlayStation3.